Our venerable father Herman of Alaska (1756 - December 13, 1837) was an 18th century missionary to Alaska. He, in 1970, became the first saint to be glorified by the Orthodox Church in America, concurrent with parallel services in another location by the Russian Orthodox Church Outside Russia. St. Herman is remembered by the Church on August 9 and December 13. 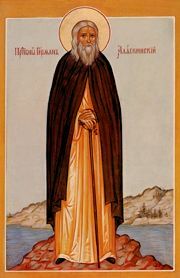 Herman of Alaska was a Russian Orthodox monk from Valaam Monastery in Russia who traveled with eight other monks in 1793 to bring the Gospel to the native Aleuts and Eskimos in the Aleutian Islands. As part of the Russian colonization of the Americas, Russians had been exploring and trading there since at least 1740. Thus, he marks the first arrival of Orthodox Christian missionaries in North America. He built a school for the Aleutians, and he often defended them from the injustices and exploitation of the Russian traders. He was known to them as Apa which means "Grandfather." He lived most of his life as the sole resident of Spruce Island, a tiny wooded island near Kodiak Island. St. Herman's Orthodox Theological Seminary (Kodiak, Alaska) is named in his honor. A portion of his relics are enshrined at the St. Ignatius Chapel at the Antiochian Village, where he is regarded as one of their patron saints. For the salvation of our souls! Guides those who follow the Orthodox way. You planted firmly in America. to proclaim the Gospel of peace. Peace for the world and salvation for our souls! This page was last edited on October 23, 2012, at 18:38. This page has been accessed 56,896 times.